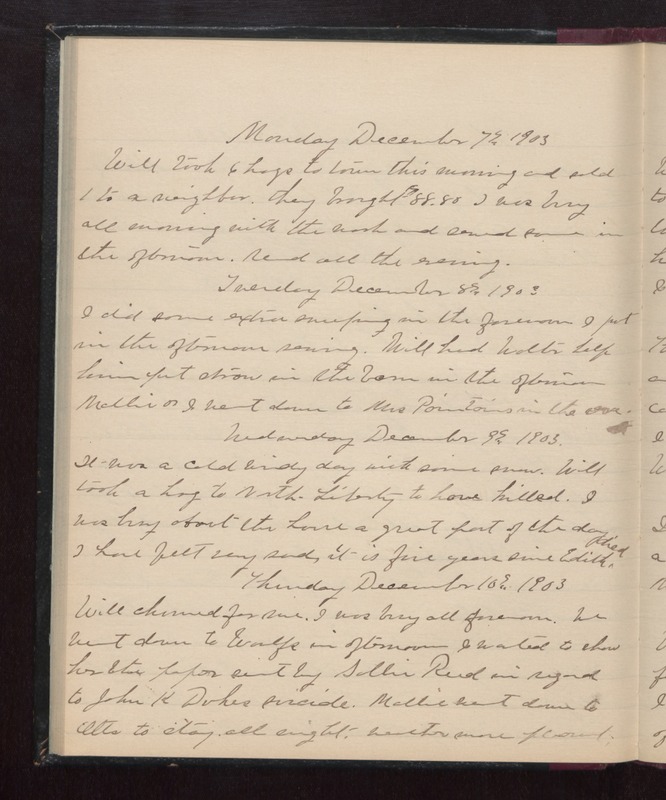 Monday December 7th 1903 Will took 6 hogs to town this morning and sold 1 to a neighbor. They brought $88.80. I was busy all evening with the work and sewed some in the afternoon. read all the evening. Tuesday December 8th 1903 I did some extra sweeping in the forenoon. I put in the afternoon sewing. Will had Walter help him put straw in the barn in the afternoon. Mollie & I went down to Mrs Pointains in the [eve?] Wednesday December 9th 1903 It was a cold windy day with some snow. Will took a hog to North Liberty to have killed. I was busy about the house a great part of the day. I have felt very sad. it is five years since Edith died. Thursday December 10th 1903 Will churned for me. I was busy all forenoon. We went down to Woolfs in afternoon. I wanted to shoe her the paper sent by Sallie Reed in regard to John K Dukes suicide. Mollie went down to Otts to stay all night. weather more pleasant.